Last January 25, 2011, the St. Scholastica’s College-Manila community celebrated the 78th birth anniversary of one of their most outstanding Scholasticans: President Cory Cojuangco-Aquino. The day started with an AVP showing President Cory’s Scholastican roots, which was put together by handpicked Mass Communications majors of the College. 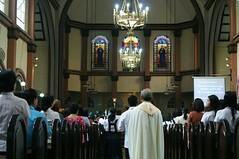 The video presentation was followed by a mass led by Fr. 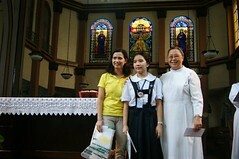 Ely Santos, SDB at the St. Scholastica chapel. “Today our former President Cory would have turned seventy-eight,” said Sister Mary John Mananzan, Prioress of St. Scholastica’s College-Manila. “We make her birthday a good reason to gather around the table of the Lord to give praise to God for the gift of her person." 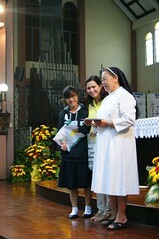 Prior to the event, the administrators of St. Scholastica organized an on-the-spot essay writing contest for the students, with President Cory as the subject matter. Four notable students emerged victorious: Angela Louise D. Serafico of Grade 4-St. Placid, Mykaella Karganilla of Grade 6-St. Odilo, Kara Danielle Medina of Year IV-Honesty, and Alekxandra Toyhacao, AB Literature 2. Their exemplary essays, also showcased in the exhibit, can be viewed below. While cruising along the Ayala Museum, a yellow dress caught my attention. What was so important about this dress that it would be hung up in a museum? There were even pictures of a woman with so many people around her! It read “Corazon Aquino Gallery.” Who was this Corazon Aquino? I kept on repeating this in my head. When we reached home, I couldn’t hold my curiosity any longer. I immediately searched the computer until I felt like my brain was going to explode because of all the readings I discovered! I discovered a lot about her that day. Cory was just a simple housewife that lived up to the responsibilities of a leader; even if she had no experience, even if she had to run against a powerful dictator. Even if she knew her family was in danger, she knew she had a bigger duty to perform, and tackled the challenges head-on. Eventually, she won the elections and during her 6-year-reign, she made the Philippines better because in her heart she was a strong-willed and determined leader. She did this with the help of us Filipinos and with the Higher Authority. She never lost hope in spite of all the struggles we went through. Knowing all these, I am very proud that I am a Scholastican like her. I believe she exemplified the values of a true Scholastican – discipline, principled, and a proud to be a Filipino. And now, as we are nearing her birth anniversary, I am reminded that there is also someone who was once a young Scholastican like me. Someone who was a hero and mother to all. She serves as an inspiration to Filipinos, women, and young Scholastican girls like us. She was the woman who changed our lives; the woman who had a lot of achievements though she committed mistakes here and there. The ordinary woman who did extraordinary things. The woman, despite many “coup d’etats” that she received, carried on her work to make things better for us. But many years later, she was confined in Makati Medical Center for colon cancer. She died at age 76. 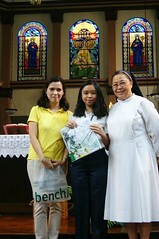 After her burial, I realized that she taught us to be responsible in everything. And, she taught me a very valuable lesson: I can and should dream big, not just for myself, but for the country. So let us help her son, PNoy, in carrying on her legacy: Make the Philippines great. The fight is not yet over. As long as her followers remain loyal to her, Cory’s spirit will remain. Have you ever felt like a bird caged in a cruel place? Or did you feel free as an airplane, flying over countries? If you answered both, then let me tell you something. I bet you already know Cory is. Yes, Cory Aquino is the Mother of Democracy. She was called that way for she was the one who maintained or restarted the engine of democracy when it seemed to fade in the country. And because of that, I can truly state that she was the kind of President she was with the help of the molding of the school that she once attended. And that school is none other than St. Scholastica’s College. But why do I think that St. Scholastica’s College was the one that molded her? Scholastican traits are evident in Cory Aquino. Humility and honesty are jiust few examples of what made Cory such a remarkable person. She thirsted for human modesty, justice, and of course, democracy. And also, those are the purpose of a Scholastican endeavor. As I have mentioned, in her term, Cory made sure to restate the name of democracy in the Filipino hearts. Bearing that, she brought on a proof that she held the kind of leadership a Scholastican provides. Once, it was announced in the news that in Cory’s term, she wore not flashy clothes but only what an ordinary person wears. She went regularly to Mass like an ordinary believer. Be it an event, an assembly, or even a school or community project, Cory attended to them with a stance like an ordinary person: no flashy cameras and no flocks of bodyguards surrounded her every single day of her life. That is simplicity: another Scholastican trait. I recall that she had once declared before, “I have reached a point in life when it is not longer necessary to impress. If they like me the way I am, that’s good. If they don’t, that’s too bad.” Now I think that that perspective was baked with the icing of the Scholastican values. She wanted to be just the way she was, and I do, too. It is known that Cory had lost her beloved husband. because of such a melancholic occurrence. Every Filipino considered it a tragedy. But even with that Cory held on for those who loved her and ran the wheels of her life without a vengeance. Every corner of the universe adored that part of Cory. And I could conclude that that part of her is empowered by the Scholastican values in her. Although I have a delicate evidence to prove that, I know that it is enough. Because being a Scholastican helped me be bold and strong without having to trample on someone. The kind of leadership that Cory had constructed proved that Scholastican values are evident in her. I want to change the world. I want to make a difference of great proportion and magnitude – the likes of which will make me impossible to forget. I want to start now. When I leave this school in eight weeks, I want to be greatly missed. I am a leader; a Scholastican; a Scholastican leader: for us, these desires are common. “Scholastican leadership” – two simple words laden with so much meaning that any single interpretation cannot even hope to encompass what is in its entirety. We say that we “create leaders”; but then, how are we different from the ten other top schools in the country that boast the exact same claim? The idea of what we say we are has always been revered, but never satisfactorily defined – that is, until twenty-five years ago. From then on, we knew exactly what we have aimed, and continuously aim, to be. In 1986, at a time when Philippine politics was most unstable and Filipinos have lost faith, a choice was presented to a woman in yellow. She was faced with the unique opportunity of becoming a country’s hope – a chance not given frequently, and not to many. However, she was ill-prepared for this destiny: she had little to no political experience, and even in herself she was uncertain if she could rise to the expectations of those who counted on her. Despite her misgivings she chose to cast the dice of fate. She set aside the fear and uncertainty she felt – and in so doing, she, of her own volition, became more than what she was. To say that Corazon Aquino was a Scholastican leader is irrevocable fact. To say, however, that she is the Scholastican leader – well, that would be truth. That she was a national icon recognized worldwide is not what makes her admirable: it is how she defined, concretized, and revolutionized Scholastican leadership that makes her worth remembering. It was her humility to realize that others mattered more than she, and that she was contributing to something far greater than herself, that shaped this country’s history. It was her resolve to see her decision through to the end, even when she was confronted with obstacles beyond her skill to overcome, that contiuously inspires today’s leaders. It was her choice to do and be more that allowed her to make a change – rather, to be the change. And it is her legacy that reminds me that I, too, can make – and be – the difference. Cory Aquino, Scholastican - two nouns that are precisely the reasons why I now sit in the middle of this boardroom amongst ten other hopefuls, figuratively backtracking over an imaginary file cabinet inside my head, trying to locate the beige-colored folder bearing the two-word label, “Cory Aquino”. You ask why, I presume. Surprisingly, I’ve been asked to participate in an Impromptu Essay Writing Contest about the late President, and what I will write depended so much on that folder I am trying to look for. “What to write?” I can’t help repeating to myself. For the first time in a long time, I am stumped. Not only because I can hardly remember the last time I did this, but also because, well, there isn’t much I recall about Mrs. Aquino’s time in office. I shyly looked around my competition, and came to the obvious conclusion that we are all so unique from one another. Each of us – with a pen on hand, and a thought in mind – is far more different than the next. And yet, I couldn’t help but wonder why despite all the differences, there is that unmistakable similarity with each other. And then there it was, the answer that I have been looking for, and the seed of what will become the tree of my essay: Character. We all have character. One that is being built through the unique learning experience we acquire from this school. As a person and as a leader, Mrs Aquino had it, too. From the moment she began in this school, through her days in office, until her last days battling colon cancer, President Corazon C. Aquino had the Scholastican character that can only be imbued from and developed in the prestigious St. Scholastica’s College – Manila. This deep character in itself is precisely the reason why she is one of the greatest leaders of her time, and in our small, but proud community. I could not think of any other Filipino who embodied the title phrase of “Ora et Labora” in all its essence. Cory, still gravely hurt from the assassination of Sen. Benigno Aquino, Jr. her husband, nevertheless, stood still and continued the job to be done for the country. President Cory, who often included words such as “hope”, “prayer”, “love”, “miracle”, etc. on her speech allowed herself to be guided by diligent and whole-hearted prayers, while undertaking the crucial job of ruling the country. “Ora et Labora” was unmistakably Cory’s guide to life in contrast from the rest of our political leaders. 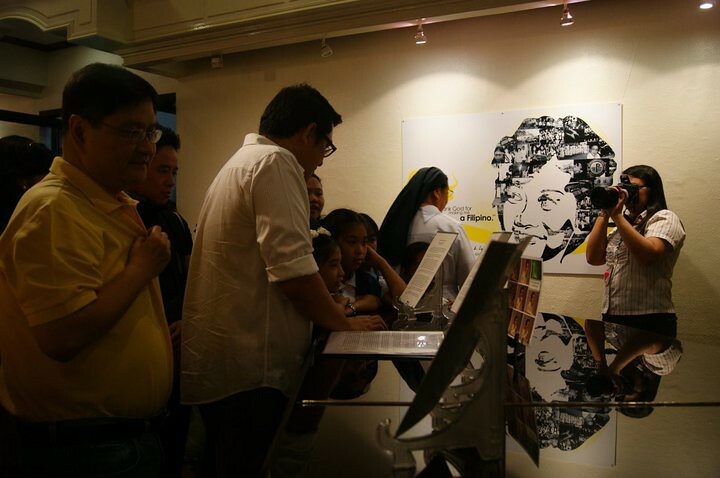 Another thing that made Cory Aquino a Scholastican leader was her simplicity and humility. 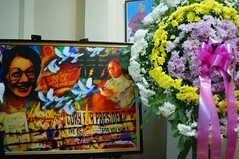 In fact, if there is any other phrase to describe the late President, it is that she is a “simple and humble” woman. The “typical housewife” as she was always branded fitted her so, not meant to disrespect her, but rather to compare her to the simple mother who patiently waits and decides for her troubled children. Allow me, but have you, at least once, seen her paintings? Or read her “Prayer for a Happy Death”? When people said that art reflected man’s soul, they were not kidding. As is reflected on Tita Cory’s works of art. Her colorful paintings were that of flowers, baskets, and rosaries – the little things in life. It is clear that an appreciation for the things that most people take for granted is a clear sign of honest humility. With the careful strokes of a round brush, the beauty is in the understanding that there are only what is enough, and not any excesses. Meanwhile, her prayer poem perfectly represents Cory’s simplicity. From the very literal wording of the title (“Prayer for a Happy Death”) to the verses that follow, there are hardly any that tell us otherwise. It does not beat around the bush. Clear, concise, and complete – the prayer poem is a simple acceptance of one’s humanity and the truth that being human entails: that which one must return to her/his Creator. Cory’s works are testaments to her simple and humble character. Thirdly, Cory’s selfless act of service made her a great leader as well as a great Scholastican. Isn’t that what we are all taught during our time in this school? We, who are very lucky and blessed to be in a place where we can learn about so many things in life are created for the very purpose of service: to God and to our neighbors. There was Cory, who had the better option of living away form the dirty political arena, nevertheless, continued what was left of her husband’s duty, and that is to dedicate oneself for the good of others. Frankly, if you ask me, Cory had every right to turn away from the public and step down from the position. Wasn’t it for the Filipino people that Ninoy Aquino had to die? Pitting herself against Ferdinand Marcos could, nonetheless, make her the very same sacrifice that her husband ever was. Yet, Cory bravely took on the challenge, and we continue to admire her for it. Such selfless act was a true sign of great love of service for the people. And finally, the very reason – my favorite, in fact – why the late President Cory Aquino was every bit of the Scholastican leader that she still is: she was an element of change. Change for the better, that is. After so many years of dictatorship, she helped make us realize that we have the capability to stand up and fight our selfish aggressors. It was Tita Cory, the hero of the first ever EDSA People Power, who made us realize that change for the better is beautiful. How magical it must have been to stand in front of hundreds of people only to become the very beacon of light. She shared the burning flame inside her and ignited the very little sparks in our hearts making us realize that we deserve better, and we can do something about it. 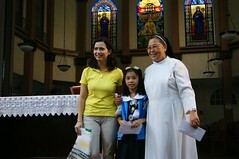 Tita Cory, though no longer physically present, will continue to live on so long as the Scholastican character that has guided her throughout her life remains in us – the next generation of Scholastican leaders with the same principle of “Ora et Labora”, values of simplicity and humility, love for service, and desire to be an element of change.